Hard rock band and/or singer (pseudonym of Vincent Furnier), both can look back on a long musical career. The name comes from the desire of the band from Detroit, Michigan to create the strongest possible contrast between its reputation (loud, crude, crazy, even sick) and a name to bring all this out into the open. ‘Alice Cooper' had a sufficiently innocent ring to it: it evokes the image of a schoolgirl with a ponytail, or a little old lady dozing in church. There are fans who do not accept this explanation. 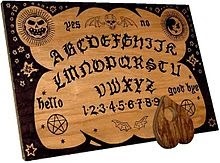 They maintain that ‘Vince' used a Ouija board (see the picture, pronounced as weedyah board), a primitive looking tool that makes it possible to ask questions during a séance that are answered by the subliminal self. Alice Cooper aka Vince Furnier is also said to be – it's getting a bit weird now – the reincarnation of a witch burnt at the stake in the 17th or 18th century.